Recall that we are looking at a long term plan; at LEAST 35 years! Thirty five years would be a 50 year old who retires at age 65 and lives another 20 years; 45 years for a 40 year old and 55 years for a 30 year old. You need to accumulate a lot of money by age 65 to cover the non-accumulation years. I have already demonstrated that a Diversified Portfolio cannot perform as well as the Dow because it is hobbled by the presence of bonds; the higher the ratio of bonds to equity, the worse is the performance. Given the long time horizon, there is no need for Bonds in your portfolio in order to reduce “risk”. Your biggest risk is that you won’t have enough money at the end of the accumulation period. That leaves us invested in stocks only. The chart below shows that the average investor fails to capture all that the market has to give … by a long shot. 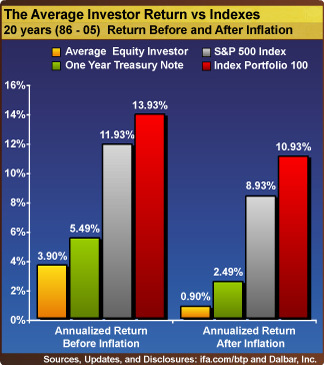 I have also shown that even a 100% equity Diversified Portfolio does not outperform the Dow. The Plan is guaranteed to capture “all the market has to give” because you are buying the one security, VTI, that defines “the market”! That’s it. Buy VTI only and be assured of having as much money as possible by the time you retire. After you retire, keep your money invested in VTI so that you continue to grow your wealth.